Barestto: Professional Coffee machine maker. 1)Effortlessly making superior flavor coffee with one minute. Enjoy a homemade and authentic Americano as in a coffee bar. 2) Made from FDA approve 18/8 stainless steel , safe to your healthy and environment. Easy to clean by dish washer or a soft cloth. 4) 355ml travel cup nice for nice and hot drinks, convenient to take. Can match car slot, school bag, backpack and can even take by hand. 5)Nice gift for friend and family. Great Present for birthday, homecoming, graduation, Thanksgiving and Christmas. 1)We will upload more product such as drip coffee maker, espresso coffee machine, coffee grinder, coffee capsule and related spare parts, please find them by searching our brand. 2)You satisfaction is our greatest pursuit, please feel free to contact us if you have any question. 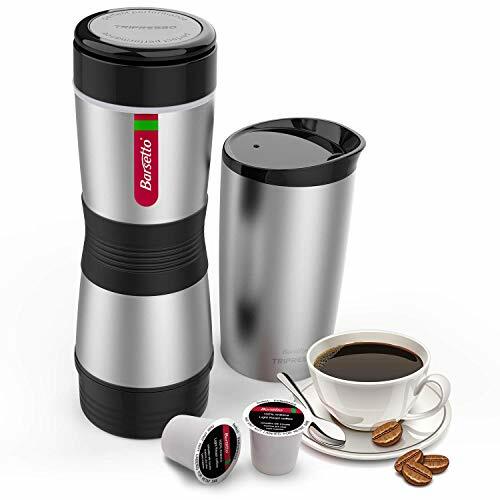 Durable professional portable coffee maker brews up to 355ml (12floz) of coffee. Consistent great flavor from the first to last drop. Stainless steel coffee maker with high quality anti-slip silicon, safe to dish washer and easy to clean. Double wall vacuum giving you unbelievable insulation while fully closed. It can keep cool for 6 hours or keep hot coffee warm for 6 hours. Suit for all K-cup capsule and all kinds of coffee powder, easy to get and easy to operate. Prefect for home, office and business. 2 year Warranty: 24 months product warranty and 24/7 customer service. Keep you money safe and provide a wonderful service for you. If you have any questions about this product by Barsetto, contact us by completing and submitting the form below. If you are looking for a specif part number, please include it with your message.